Commercial kitchens big and small use a significant amount of resources in the process of creating and delivering food to a volume of people. However there are ways to minimise their environmental impact, save on energy and water costs and still deliver great meals. Greening up any space should be done in a holistic manner with consideration to all elements including energy, water, waste, the local environment and how you use it. So here the low down on greening up your commercial kitchen. Unless you’re about to embark on a full scale kitchen renovation, you will need to maintain normal operations while improving your level of ‘greenness’. So in this article we will focus on the items you can easily retrofit or do with just a small amount of kitchen downtime (if any). So here we go. Alsco’s Continuous Cloth Towel are hygienic, soft, super absorbent cotton towels with an easy to use cabinet system. These towels offer significant environmental benefits as compared to paper towels. If safe and healthy environment is what you want, all you need to do is ask Alsco. This is simply looking at your bills (energy and water) and understanding how much you are using and when, so that you know your starting point and can measure any changes as you go. Plotting energy and water usage in simple spreadsheet is all that’s needed to produce a graph of what you’ve used over the past year. You’ll probably notice seasonal trends in your data and it will most likely correspond with business activity. So there’s your baseline. By that we mean ‘how do you use the kitchen’. Look around to see what’s happening during operational hours and ask yourself the following questions. Do you leave taps running when cooking and preparing food? If so turn them off, sensors can really help with this if having a free hand is problematic. Do you turn off all cooking appliances when not in use? If there’s a good reason to have it left on fine, but if not just turn it off. Do you always run dishwashers and glass washers on a full load? You should if you can. Do you service cold rooms regularly and keep temperatures at the right level? Maintaining chill room motors, checking the door seals properly when closed and ensuring they are not over/under cooled is important for energy efficiency and food storage. Is everything completely off when the kitchen area is closed? If not could it be? What is your purchasing policy for replacing appliances? Do you just replace like for like, or do you take the opportunity to upgrade to the latest and most efficient appliance? If time permits, look around and set up a succession plan for major appliances, that way when they go you don’t have to waste time finding a replacement, just get it and install. Where do you get your food from? Always aim to get local, fresh, organic produce if you can. It would taste better, have a lower environmental footprint and it’s nice to know your air miles are more than the ‘food miles’ your foodstuff has travelled! Is your cooking oil collected and recycled? If not it could be. And in terms of waste, do you separate waste into organic waste, co-mingled recycling and general landfill bins? If not see if that’s something you can introduce. The organic waste can be dug into local gardens, put into worm farms or even disposed of via a waste dehydrator and reused. It’s worth looking into and can significantly reduce waste to landfill. 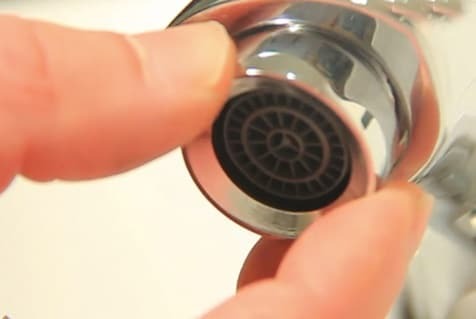 Tap ware – install flow restrictors (just a few dollars and DIY job) to kitchen and bathroom taps, and upgrade to a highly water efficient pre-rinse nozzles (6 star WELS rated or 6 litres a minute flow rate or less). This reduces water consumption without loss of amenity very easily and cheaply. Check your commercial glass washers and dishwashers – ensure the washer recycles water and carries a conformance certificate for Australian Standards (needed if rebates are available to upgrade). As with any appliance, always choose the most water and energy efficient model you can. If you use a Wok – look at Waterless Wok Stoves. They save significant amounts of water. There are also water efficient Combi Steamer Ovens – upgrade to one of these if you’re changing any equipment out. As usual, choose the most water and energy efficient model you can. Check your local government and water companies rebates and grants – you’ll find many offer financial support in one way or another to help businesses upgrade to better, more efficient equipment. And now for energy saving items. Generally speaking things that heat use lots of energy, and kitchens have lots of things that heat. So here are some items to help with energy conservation which are over and above the behavioural things mentioned earlier. Ensure lighting is energy efficient and only on when needed, this includes heat lamps to keep food plates warm while waiting to be delivered. Always purchase the most efficient appliances you can when replacing items in the kitchen. And make sure it is the right size for the job. Oversized and undersized appliances simply waste energy (and if undersized, also waste time by having to run them several times). Check if your hot water supply is adequate for your needs and as efficient as it can be. For example, a small electric storage unit constantly boosting is highly inefficient and would use excessive energy. Ask a qualified energy auditor or EcoXpert electrician if the motors on the exhaust fans and cold rooms would benefit from variable speed drives. Depending on the site, the appliance and usage, these can reduce energy use by up to 30%. Be sure to make notes of when you make changes (mark dates on a calendar or similar) and every few months update your energy and water spreadsheet data and see how it’s going. If you make changes you should see a reduction in energy and water use over time, saving you dollars and helping the environment. If you are planning on a full kitchen renovation don’t forget to use low/no VOC paints and cabinetry, building in easy to use recycling points near food preparation areas and designing for efficiencies. Again, a properly qualified sustainability person should be able to help with this if you need some guidance. Green Moves provides totally independent, holistic sustainability and resource efficiency advice and guidance to both commercial and residential sectors. We do not sell or take commission on any products so remain totally impartial in terms of advice and guidance given to clients. We practice what we preach and are experts in our fields working with several State and Local government bodies, educational sectors and a wide variety of commercial clients. Alsco would like to thank Danielle King for this article. She is the Director and Senior Sustainability Consultant at Green Moves Australia. Alsco also offers cost and energy efficient renting solutions. With a wide range of customised services to suit your needs, you’ll sure create and maintain a greener workplace. Save on cost and go green, partner with Alsco. Call us 1300 659 892 now.